When a dollar wasn’t always a dollar. 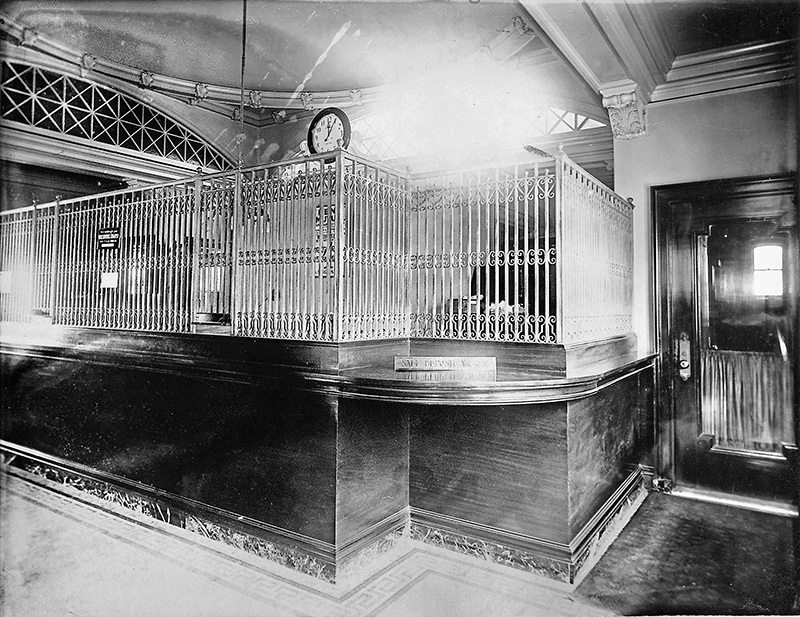 Early interior of the Martha’s Vineyard National Bank in Vineyard Haven. The Coinage Act of 1792 established the U.S. dollar as our country’s official currency, based upon the Spanish milled dollar. But the old system of pounds, shillings, and pence was still used on the Vineyard for years afterward, even into the 19th century. In 1798, for instance, the town of Tisbury set the tax rate for the year at “Eight pence on the pound.” These weren’t pounds sterling, the British standard; they were Massachusetts pounds — worth somewhat less, and different in value from the New York pound or the Rhode Island pound. Children labored in school to learn how to convert one state’s currency into another. They weren’t always real, either. In 1778, Tisbury selectmen had to scramble to make amends after inadvertently paying Constable Josiah Hancock’s salary in counterfeit pounds. But the dollar soon arrived on the Vineyard, although the earliest references are likely to be the Spanish dollar, sometimes known as a “piece of eight.” In a 1785 town meeting, for instance, nine years before the U.S. dollar even entered circulation, Tisbury residents voted to give Oliver Rogers and his children “One Yoak of good working Oxen and One good Draught Horse and Ten Dollars in Monney” to help move his family to Vermont. For some 80 years following the adoption of the new dollar system, the U.S. abandoned paper money, although that didn’t stop local counterfeiters from trying to mint their own coins. In 1836, a scheme to manufacture false gold coins in the city of Piura, in northwestern Peru, was reported. The whaleship George and Mary, of Edgartown, under the command of Captain Coffin, transported two counterfeiters to Piura, together with their coining machinery, before their plot was discovered. Several men were arrested and the machinery seized, although the ringleader escaped, as did Captain Coffin and his ship. But as the George and Mary was liable to be confiscated by the local authorities should it turn up again, friends of the captain sent him a warning to avoid that port for the remainder of his voyage. It wasn’t until 1862 that the federal government began to print banknotes (paper money) again. Counterfeiting soon became rife; it’s been estimated that more than a third of the money in circulation nationally at the end of the Civil War was counterfeit. The Secret Service was founded in 1865, in part to address this massive problem.